Home > Tutorial > How to merge videos and create galleries of pictures? How to merge videos and create galleries of pictures? This guide is mainly about how to merge video, so you can join several video clips into one file, much easier than Windows Movie Maker. You also can capture image from movie, make your special galleries of pictures. Step 1. Open the files you want to join. You can open as many video files as you need. The videos can be from different sources and in different formats. Step 2. Arrange the videos on the list in the desired order. Step 3. For every opened video, select the segment to join by moving the left and right markers on the seek slider. Step 4. Select an output format. Step 5. Select an output directory. Step 6. Hit the Join button. Step 1. 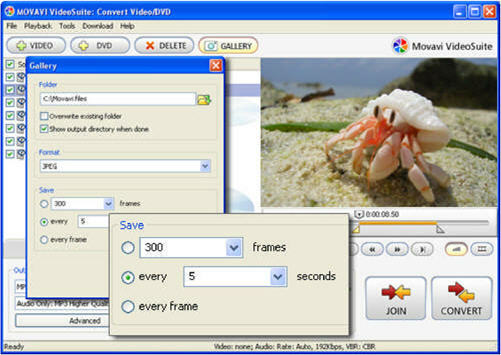 Add the video or DVD from which you want to capture still images. Step 2. Move the left and the right markers of the seek slider to define the video segment containing the images you want. You can select different fragments from each added movie. Step 3. On the Toolbar, click Gallery to open the Gallery dialog window. Step 4. Define a folder where you want to save the captured images. Step 5. Choose the desired format for the still images. 1) Set the total number of pictures to be captured from the selected video segment; the number can vary from 1 to 300 frames. 2) Capture a picture every defined time interval; the interval can vary from 1 to 30 seconds. Step 7. In the Gallery dialog window, click Start.